At Take 5! Institute, we’re convinced that our most effective actions are guided by our very best thinking. Which is why we believe that theory is such an important foundation for skillful professional practice. Put simply, practice describes what we do. Theory explains why we do it. Without the feedback and accountability loops that a good theory provides, our practice isn’t always so practical. The Take 5! approach synthesizes innovations and insights from two influential fields of research and practice: Interpersonal Neurobiology and Dialectical Behavior Therapy. Take 5! also promotes a thinking and practice orientation that is salutogenic, integrative, and developmentally-attentive – each is explained further in the notes below. Dan Siegel’s pioneering work in psychology and neuroscience has contributed important new perspectives on health, well-being, and the science of self-regulation. The principles of Interpersonal Neurobiology are integrated throughout Take 5! Here's another example: Siegel stresses the primary role of the mind in self-regulation. In fact, he says, the mind acts as the ‘regulator.’ Take 5! builds on this insight and, with hands-on tools and easy-to-learn practices, stresses mental wellness as an important goal of self-reg asset-building. We’re equally inspired by Marsha Linehan’s ground-breaking work with Dialectical Behavior Therapy. 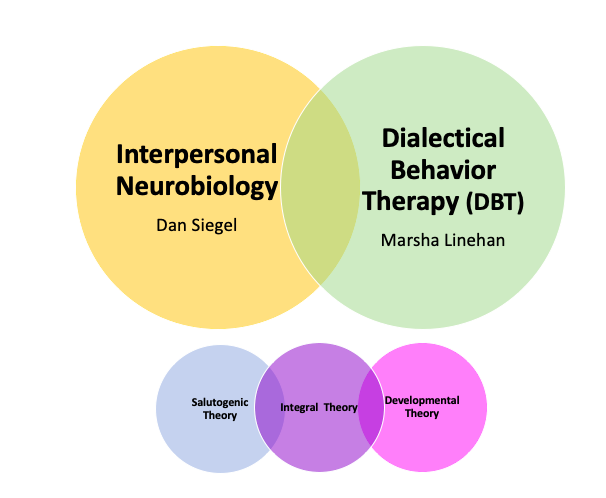 While DBT is a rigorously researched therapeutic model, there’s growing evidence that the approach is effective for preventing mental health challenges, building resilience, and fostering health & wellbeing. Take 5! incorporates four foundational DBT skills – mindfulness, interpersonal effectiveness, emotion regulation and distress tolerance. While these skills are proven to be therapeutically effective, they are also valuable tools for fostering mental well-being and resilience in children, youth and adults alike. This fits well with the goals of Take 5! - which is all about capacity-building, and not therapy. We always state clearly that, while some professionals that support young people are qualified therapists, most aren’t. On the other hand, each of us has an investment in preventing mental health challenges and growing healthy minds. Of course, we want to use the very best evidence-based tools available. And even young children can learn basic DBT-inspired skills. Take 5! promotes assets that are known to generate health, well-being and thriving. In other words, it’s salutogenic … a term borrowed from the field of health promotion; it means ‘health-generating.’ With a salutogenic orientation, self-reg capacity-builders optimize those conditions that promote higher levels of health, well-being and thriving – in people, and in systems. Of course, it’s important to identify the gaps, or deficits, in a child’s ability to self-regulate. But it’s equally important to acknowledge current and growing strengths, and offer supportive scaffolding as new capacities are explored and developed. This salutogenic approach to capacity-building is at the heart of the Take 5! approach. Educators are most familiar with two contributors to development theory: Jean Piaget and Lev Vygotsky. Piaget introduced a ‘constructivist’ perspective, illustrating how our capacities to ‘make meaning’ of our experiences grow in complexity throughout the typical stages of child development. Vygotsky adds a sociocultural lens to the study of child development, acknowledging the role of the environment and social interaction on the way the child learns and makes sense of their experiences. With both Piaget and Vygotsky, the focus is on child development. What is perhaps less well known is that adults have the potential to continue developing throughout the lifecourse. Just as our brain continues to develop throughout our lives, our mind has the same potential. Harvard University professor and developmental psychologist Robert Kegan calls this the “hidden curriculum of adult life.” There is much evidence that adults not only have the potential to develop, but that our very health and well-being depend on it. In adults, as in children, the failure to develop is the failure to thrive. And this has important implications not only for learning, but for self-regulation as well. As Interpersonal Neurobiology tells us, self-regulation is synonymous with self-integration. So, in order to grow self-regulation capacities in the young people we support … and in ourselves … we need a better understanding of integration: what it is, and how it works. In other words, we need to have a really good theory of integration in our back pocket. Drawing on Ken Wilber’s pioneering work with integral theory, Take 5! brings an integrative lens to self-regulation and social-emotional learning. Personal needs and relationship needs. Rather than viewing ourselves as a collection of separate parts, then, we see how those parts connect to form a more complex whole, a more integrated system – within us, and between us. When our bodies are not integrated, our health suffers. When our minds are not integrated, our health also suffers. In bodies and in minds, a lack of integration equates with dysregulation. The same is true in our relationships. In sum, Take 5! Self-Reg Asset-Building offers a practical way to help children and youth thrive, growing essential capacities for learning, mental wellness, healthy relationships and lifelong development. Drawing on leading edge knowledge and practice foundations in each of these key areas, Take 5! makes a unique and value-added contribution to self-regulation and social emotional learning.